Like doing anything creative, it takes courage, a fair chunk of effort and a decent sprinkle of luck to write great songs. But it also takes craft – skill that’s developed through understanding and employing tools and rules of the trade. In this session, we’ll take a look at a number of those tools and rules and how they’re applied to melody, chord structures and lyrics. We’ll listen to and discuss a few truly great songs and will roll up our sleeves and put some of these tactics to use. Together we’ll work through a few writing exercises that will help get the creative juices flowing and independently you’ll get a chance to work towards sculpting your own ideas into songs. Regardless of your experience, confidence, or sense of innate “talent”, you can come to this session knowing you’ll be developing your skills in a highly supportive environment. Christie Simmons is a Calgary-based singer/songwriter, teacher and freelance writer. 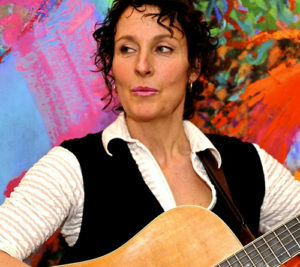 In June she released Learn You by Heart, her second full-length recording of original songs (following on Winnie’s Song). She comes to the craft of song writing as a performing musician who has dabbled heartily in a variety of musical genres and instruments (classical training in flute, competitive highland bagpipes, guitar, banjo…). She has been raised among colourful characters, visual artists and writers who inspire and support her in her effort to write music that speaks to the joys of the mundane and the magical and to the soft underbelly of life. She performs as a solo artist and plays guitar, whistles, ukulele and sings backup and lead with the high-energy, folk/roots group My Son Ted.